I am currently enjoying a great display of begonia blooms in my sunroom and this will continue right into spring. They do not begin their winter indoors by producing any colour however, as I usually just bring in cuttings or small offshoots from the parent plants, and these take time to develop attractive foliage or bloom. Among the plants that I bring indoors in the fall are dragon wing begonias, which I grow in pots outdoors during the summer, displayed on plant stands in a xeriscape area south of some mature spruce that is shaded by a large basswood tree. The cascading branches hanging down and covered with dark-red-pink bloom create a focal point in that area of the garden and by fall the branches are quite long but still covered with bloom. Before frost has a chance to damage the tender plants, I bring several pots inside for the winter. After cutting the branches back to 10 cm high (unfortunately all the bloom is cut off and composted), the pots are put in front of a west-facing window. A few slips are started from the cuttings. The cuttings (I use 20- or 30-cm-long terminal ones) are created by cutting the stems off just below a leaf axil so that new growth will sprout close to the cut-off point on the parent plants. The ends of these are dipped into a rooting hormone and then planted in pots — usually a dozen or more in a large container. A soilless mix is used, the pot has good drainage and the planting medium is damp before the cuttings are planted. The longest, most pendulous cuttings are put around the perimeter of the pot and a few shorter, more upright ones are placed in the centre. The cuttings are put quite close together and any leaves that will touch the soil surface are removed. In the fall when the plants are brought indoors, if any are several years old and appear to be root-bound and not particularly vigorous, they are consigned to the compost bin. Before that happens though, parent plants can be cut back for many years and will get thicker and bushier and more attractive with each pruning. The pots of new cuttings will replace any that have gone to the compost bin, and by spring both the parent plants and the new pots will be in full bloom and ready to move outdoors. Indoors, by mid-December, the plants have put forth enough new growth to develop some buds and soon flowers appear on the ends of the stems. The branches keep getting longer and develop more and more bloom. By late March the plants are quite large (I grow them in 14-inch hanging baskets) and they are covered in bloom, putting on a glorious show. Dragon wing begonias are rather messy plants — the flowers are similar to those of the fibrous begonias used as bedding plants — so they will drop dead blossoms, but cleaning up a bit of a mess is worth it as the plants will bloom all winter. My dragon wing begonia blooms are dark pinkish red, but they become a softer shade of pink when grown indoors in reduced light. There is also a pink-rose variety with green foliage and a variety with red bloom and bronze foliage. It is wonderful when a plant from the outdoors can be brought inside to continue to be enjoyed during the winter. 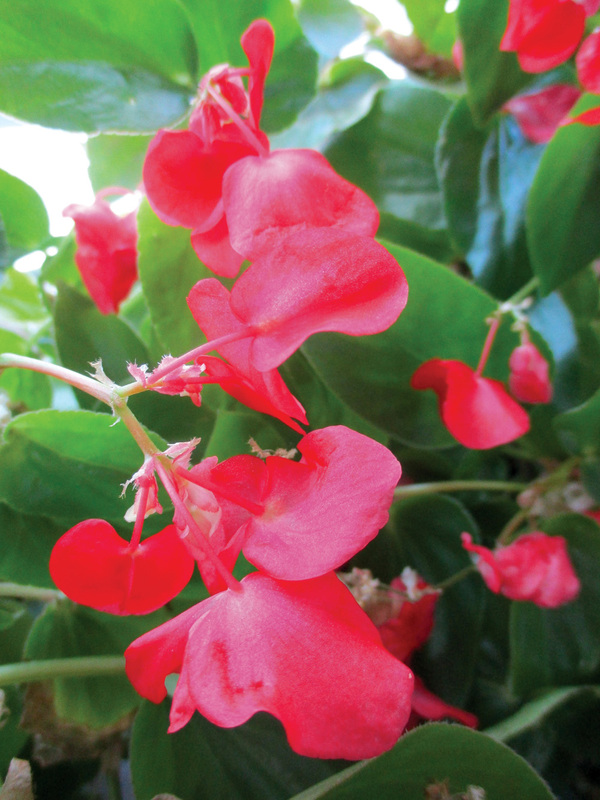 The dragon wing begonia is one of those plants!